There’s a secret that people don’t tell you about polenta: It’s easy to make! I’m pretty sure I don’t make it the traditional way since I always hear about people slaving over a pan of polenta, à la risotto, and that’s not at all what I do. I just boil water, whisk in cornmeal (fine or coarse – chef’s choice) and stir. Within a few seconds, the polenta thickens up, and you can have a meal in 15 minutes. It’s literally that easy. It’s a great side dish for thanksgiving, especially if you have vegans in your family, and let’s be honest, who doesn’t?! In terms of additions to polenta, people often add cream or grated cheese, but I’ve found that if you’re looking for a vegan/parve polenta, a great way to both flavor and add to the creaminess, is to add tons of roasted garlic. Our CSA farm offers a separate 3-pound garlic share, of which I ordered 2. That’s how much I love garlic. 6 pounds much! Roasting garlic is easy – all you have to do is lop off the very top of a head of garlic (but save those little tips! ), wrap tightly in tin foil, and throw in a 400F oven for about 30-40 minutes. Once cool, you can squish out the resultant roasted garlic easily with the back of a knife and add it to anything you’d like, from marinades to pasta sauce – or even schmear a little on top of bread. 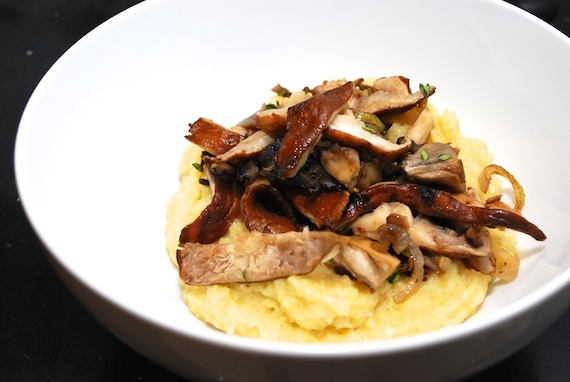 I am a sucker for the polenta/mushroom combo, a flavor profile you’ve probably seen before on this blog. In terms of the mushrooms, I often choose shitake and maitake, which can be expensive, but worth it when you factor in the immune-boosting properties. Just chop them up, and sauté over medium/low heat with the tips of the garlic, salt and pepper, thyme (if you have it) and olive oil. Mushrooms give of a lot of moisture when cooking, and I find that cooking slowly over low heat insures they soften up without burning. The Tuv Ha’aretz Forest Hills CSA we belong to also organizes shares of grain, bean and flour from Cayuga Pure Organics, an Ithaca-based company. They offer both cornmeal (finely ground) and polenta (coarsely ground). If I’m planning on keeping the resultant cornmeal soft and smooth, I use the finely ground cornmeal. If I’m planning on baking it or cutting it into squares (like this other mushroom polenta recipe), I use the coarsely ground cornmeal. Either way, cornmeal is something you want to try to buy organic, since corn is often genetically modified and sprayed with tons of pesticides. It also keeps pretty much forever, so you don’t have to worry about it going bad if it’s kept either in the fridge or freezer. I find the ratio for creamy polenta is a little more than 2:1, so if I’m cooking 1 cup of cornmeal (which will serve 2 for a main course), I use about 2.5 cups of water. Bring the water to a boil, and whisk in the polenta. I like to use a flat whisk, but whatever you have that you can keep whisking with will be fine. If there are clumps, keep whisking, and it it becomes too think, just add more water. When the cornmeal has thickened, add the roasted garlic, salt, about a tablespoon of olive oil and more water if needed. Whisk until smooth, top with sautéed mushrooms, and voila – a delicious, vegan side dish! Nice post, Alexa! And it’s really 2 posts, since you describe how to roast garlic- love that, get it by the pound, too. Have you seen food52.com? Nice blog that recently updated their site- now it looks a little unapproachable, but I like the “Hotline” feature and want to share- it allows anyone to ask a question and get an answer from other users in a timely fashion, plus tons and tons of recipes, some easy, some over-the-top (not for me). I don’t know what it is about polenta – I find it kind of watery and it’s flavour too subtle for my liking. But I like it paired with other, stronger, flavours, as in your recipe here, where it provides a nice contrast. @carol: Glad you like the post! I have seen food52, but haven’t been back recently. I will check out the “hotline” feature – thanks for the tip! @London Accountant: Sometimes it does come out watery, try to make it with stock (vegetable or mushroom) to add more flavor. Thanks for the comment! It is truly a great and helpful piece of info. I’m glad that you simply shared this helpful info with us.